This recipe can also just be a meatloaf. That’s originally what it was. I made meatloaf for my cousin and put the slices of pancetta all over the top. The result was a moist flavorful meatloaf. We each had a thick slice with veggies on the side. The veggies really balance the richness of the meat, so I thought that this would be great on top of a portabella mushroom. These mushrooms are hearty and have a meaty texture to them. They are the perfect vessel for these individual meatloaf’s and everyone gets their own piece of pancetta. Remove stems from the portabellas and chop finely. With a spoon, scrap away the gills to make a bowl for the meatloaf. Rub the caps of the mushroom with olive oil and place on a baking sheet lined with aluminum foil. Set aside. In a large bowl add the sausage, ground beef, bread crumbs, onion, garlic, sun-dried tomatoes, mushroom stems, parmesan, oregano, parsley, egg, salt, and pepper. Combine mixture but do not over mix. The baking sheet will have the juices that the mushrooms and meatloaf have released, and you don’t want them sitting in that, so transfer to a storage container if not eating them right away. As the pancetta crisps, it renders some of its fat which bastes the meatloaf and keeps it moist. If you don’t have pancetta, you can always cut up strips of bacon, but use thinly sliced strips. 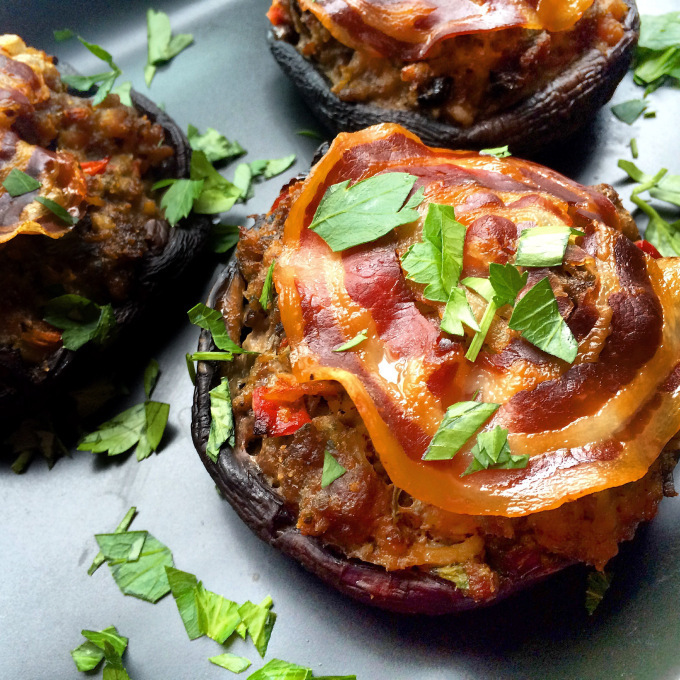 These mushrooms are so hearty and filling that it just needs a side salad to finish the meal. I consider this a low carb meal even though there are breadcrumbs. But for people who are really strict, they can easily swap the breadcrumbs for almond flour.